ANAHEIM, Calif. – The Miami Marlins are somewhat relevant, and not in that empty "spoiler" way, code for "Who cares, we're done." Few believed the Marlins would be so, and probably more than a few rooted against it, given the way the owner conducts his business. But, well, here they are, at .500 in late August, an intriguing three games back in the wild card, 11 months after they lost 100 games and nearly four since Jose Fernandez threw his last pitch. They're one imprecise or unlucky week from irrelevance, a couple bad weeks from their fifth consecutive losing season, and yet they've nearly reached September and the games still feel important. They're here for three and then they'll play the Atlanta Braves six times in 10 games, at the end of which we should know better if the Marlins will carry some life into the final few weeks, whether owner Jeffrey Loria deserves such gentle fortune or not. The Marlins may indeed be average, but they've worked themselves hard to be average, come a long way for it, and the National League is forgiving, if not so forgiving that it's easy for any team, particularly one on a $46 million budget. So, it would be unkind to ignore where they've come from, and what they've done with what they have and, of course, what they've done considering what they lost. 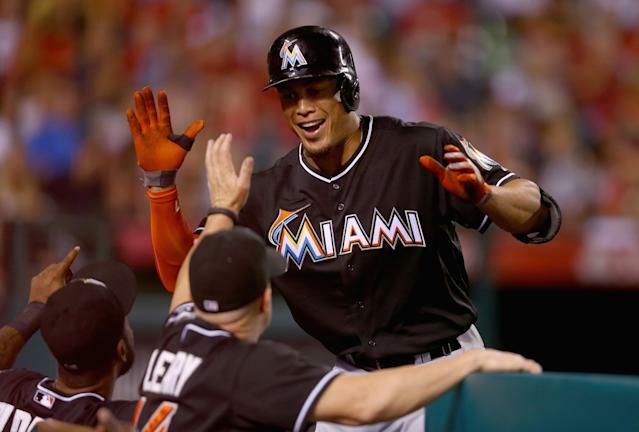 That is why Giancarlo Stanton chose his words so carefully Monday afternoon. Above all else, he must honor a team gutted and sent back out there, a team that might've lost another 100 games but won't, a team that wins 11 times on walk-offs and 32 times by one run, and that hasn't given up anything yet. The question was whether the events of this season had altered his top-down view of the organization. He'd raised his eyes, thinking. "Five months," he said, "doesn't change five years." The men in this clubhouse, the manager, the general manager, it seems they're in this thing – whatever it is, whatever comes of it – together. In a small, kind of spirited way, they've made something of it, too. They didn't roll over. The lowest payroll in the National League has wrought the smallest attendance in the National League, though Marlins Park is three years old, is quite comfortable and convenient, and happens to house perhaps the Most Valuable Player in the National League. That being Stanton, 6-foot-6 inches and 240 pounds of archetypal ballplayer, at just 24 years old. He hit his 33rd home run Thursday night, a one-iron stinger to left-center that accounted for RBIs Nos. 95 through 97. He can be a free agent in two years. Already there's speculation he could be traded before then, before his arbitration years grow too rich for Loria. There've been suggestions the Marlins would seek to sign Stanton to a long-term contract at something like real market value, and it was impossible not to be reminded Monday night at Angel Stadium that the Los Angeles Angels have an archetypal ballplayer of their own. A year behind Stanton in service time, Mike Trout has $144.5 million coming over six years, starting in 2015. Trout also hits in front of Albert Pujols and Josh Hamilton. Which is to say, Stanton does not. When Stanton does get that contract, whether it's in Miami or not, it'll be for all or the better part of his prime. He does love Miami and the people there. He does believe they deserve a ballclub they can rely on. That's not entirely up to him. He can show up, grow into an MVP candidate before them, make good money, give them truly great moments. But will the Marlins compete? Will they commit to that? Have they yet? So, yeah, 2014 has been interesting. Maybe even hopeful. Thing is, it's not the wins, but the sustainability of them. It's not the improvement, but the commitment to it. It's not the season, but the era. And maybe that's why Stanton hesitates. On Monday afternoon, he declined to discuss something so wispy as an MVP award, but did talk about the dedication to an offseason program that has kept him on the field. He's played in every game, starting all but one. "The way I felt last year, with the whole situation of losing and not playing my best, that was one of the worst feelings I ever had," he said. "I put it as a waste of time. I spent all that time in the offseason. To lose 100 games and to not do my best? It was like, 'What'd I do all that in the offseason for?' "
Now he's a .300 hitter, .322 with runners in scoring position. He leads the National League in on-base percentage, in part because he leads the league in intentional walks, and OPS. He's become an elite right fielder. He walks by and big leaguers look him up and down, shake their heads and mutter a single word: "Beast." So, who's with him? The Marlins? Loria? And what about tomorrow? How about then? "We've definitely done better than anyone thought we would do," Stanton said. "At the same time, we're still not where we need to be to keep playing beyond the designed schedule. …I want to be the only game on TV at the end of the day. "We're definitely in a positive direction. But we have a month to go to make the playoffs." The question, then, again: Does this season, one that is just OK but brighter than most, change anything? He thought again, perhaps of these five months, perhaps of these five years. "There's still a long ways to go to be in the same conversation with the best of the best," he said. "I'm hungry for that."